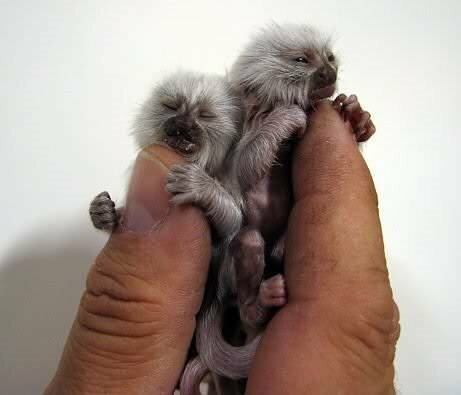 The Smallest Monkeys in the World: Pygmy Marmoset - 5 to 6 inches in length! Meet the titchy thumb-sized pygmy marmoset monkey, named after the French word marmouset, which means shrimp, or dwarf, "They range in length from 5 to 6 inches not including the tail, which is an amazing 6 to 8 inches. There are 18 recorded species of marmoset and, unlike other monkeys they have claws rather than nails, tactile hairs on their wrists and lack wisdom teeth, making them slightly more primitive than other monkeys. 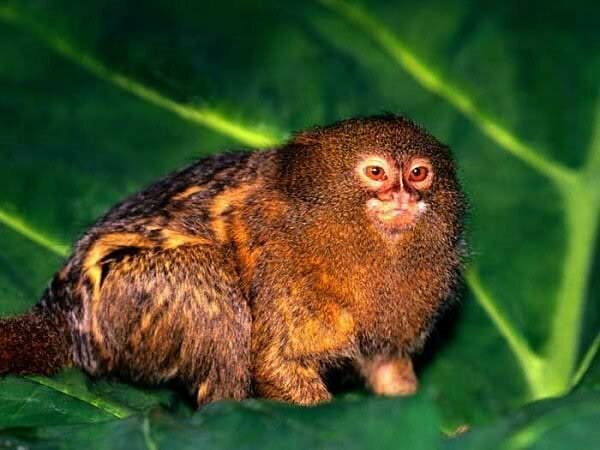 Pygmy marmosets are found in the rain forests of Brazil, Ecuador, Peru and Columbia. They live in the upper canopy of the forest, no doubt to steer clear of bigger, heavier predators, and survive on an omnivorous diet of fruit, leaves, insects, small reptiles and their favorite nibble, tree sap. Specialized incisors enable the marmoset to gnaw through even the toughest tree bark, allowing easy access to their favorite gummy fluid.